In honor of the baby Panda Mei Xiang from the National Zoo in Washington, we want to create a cutie panda nail art. 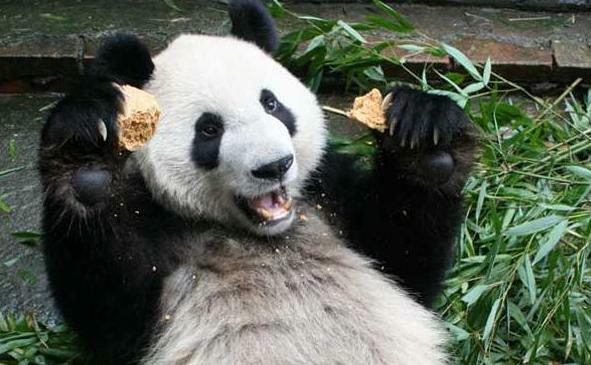 As much as they are one of the cutest animals, giant pandas are endangered species. Everyone celebrates whenever there's a baby Panda born in a few conservatories around the globe and mourns when a baby panda dies like Mei Xiang. Sustaining the Giant Panda has reached a critical point. We must work to save the Giant Panda in order to allow the world the continuing benefit of one of its most extraordinary creatures (pandasinternational.org). In our support to this, here's a panda nail art for you to re-create!!! STEP 1. Prepare the lacquers needed; white and black lacquers. Prep your nails with your base coat and then paint your nails with a sheer pink lacquer, this step is optional though. STEP 2. Get your white lacquer and create a half-moon or longer. This will serve as the panda's body. STEP 3. Get your dotting tool and black lacquer, and create small dots. 2 dots above the half-moon, this will serve as the ears. 2 dots on the upper part of the half moon for the eyes and small dot below the dots for the eyes. Then, a dot on both side of the half-moon for the arms. STEP 4. Get your dotting tool and white lacquer, then dot the eyes. Once dried, dot it again with black lacquer to create a 3D effect of the eyes. STEP 5. Seal in your design with your top coat, this will create shiny and glossy pandas! Don’t forget to join beautyamare.com for more Fashion, Beauty, and Nail Art ideas. Hi luch luch! Yes, please..tag us..we love to see it! !you have a nice blog! let me know if you want us to follow each other! Hi Janet!Thanks!you can re-create and tag us!thanks!